For each of the next three weekends, one of you will receive all of what you see above (except for the teeny picture of me!). 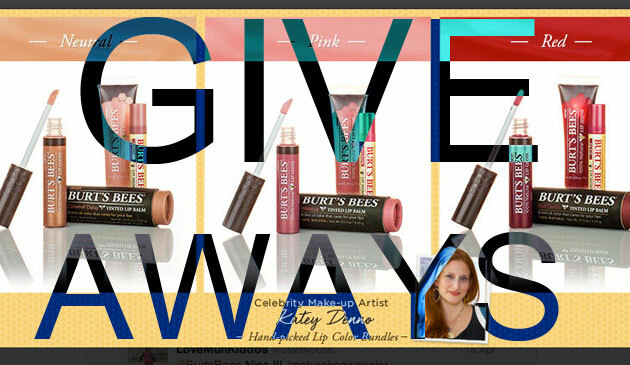 At the risk of sounding like an infomercial, that’s TWELVE fantastic lip products, and all you have to do is enter to win via my Facebook page. You’ll have 24 hours each weekend to submit your entry, and I’ll announce the winner at the end of the weekend. In three different color families, you’ll get a tinted lip balm, a light reflective, color-packed lip shimmer, an intensely pigmented lip gloss that’s the perfect level of shine and never sticky, and a deliciously scented and lightly flavored gorgeous lip shine in an easy to apply squeeze tube. Red bundle consists of Red Dahlia Tinted Lip Balm, Pucker Lip Shine, Raisin Lip Shimmer and Ruby Moon Lip Gloss. Pink bundle consists of Hibiscus Tinted Lip Balm, Blush Lip Shine, Rhubarb Lip Shimmer and Spring Splendor Lip Gloss. Neutral bundle consists of Caramel Daisy Tinted Lip Balm, Whisper Lip Shine, Peony Lip Shimmer and Fall Foliage Lip Gloss. Finding just the right lip color for yourself -no matter which color family you’re looking at – can be difficult, and I’m not suggesting that each of these bundles will be perfect on all women. However, one thing in which I have complete confidence is that you can create your perfect shade of lip color by mixing and matching and making your own blend of colors that makes your eyes pop, your teeth look their whitest, and your cheeks rosy. That’s what the magic of the right lip color can do for each of us. Click here to watch some videos of lip color suggestions I’ve made to help other women find their perfect shade with Burt’s Bees! You can check out the Lip Shade Finder that I created with Burt’s Bees to find out more about which colors will best suit you, based on your skin tone, eye, and hair color, here.